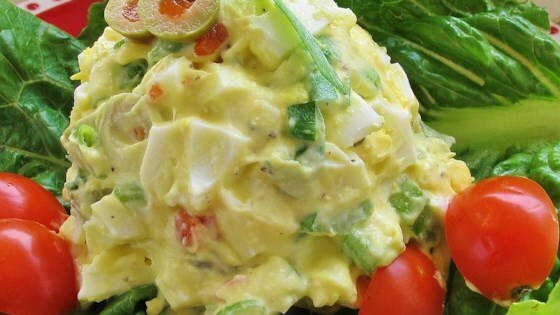 "This is a great egg salad recipe that a woman I babysat for made! The key ingredient is the chopped pimento stuffed olives. Serve on toasted bread with lettuce and a bit of chopped celery." Place eggs in a medium saucepan with enough cold water to cover, and bring to a boil. Cover saucepan, remove from heat, and let eggs stand in hot water for 10 to 12 minutes. Remove from hot water, cool, peel, and chop. This is my favorite egg salad recipe. It is the exact recipe my mother used.. and the secret IS the olives! Absolutely wonderful. This recipe is not good. The eggs come out way underdone. I would not recommend it at all.